Baosteel, China's largest steel maker, has completed a project to double the capacity of the Majishan Port near the estuary of the Yangtze River, China's vital waterway. The undertaking, dubbed the second-phase project of the Majishan Port, includes establishments of berths that can accommodate ships with 10,000 to 300,000 dwt (dead weight tonnage), and a 0.32-square-kilometer ore ground built on polders, according to company sources. The project, which was completed on Saturday, is expected to boost the port's handling capacity from about 26 million tons to 50 million tons a year, sources said. The Majishan Port, located on the Majishan island off east China's Zhejiang Province, was China's first deep-water port built on an island. 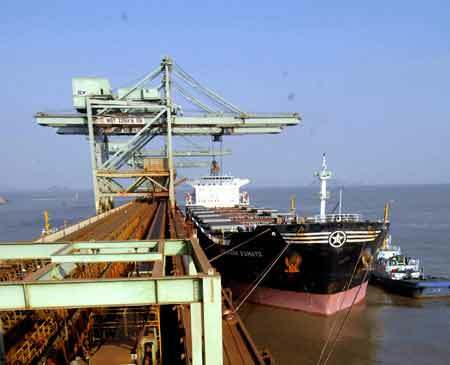 The first-phase project of the port, which became operational in 2002, was planned to facilitate iron ore imports for Baosteel and other steel companies along the Yangtze. 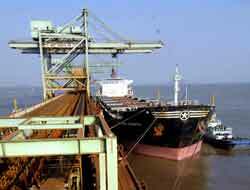 It handled about 26.16 million tons of cargoes in 2006. The Shanghai-listed Baosteel garnered 8.16 billion yuan (US$1.1 billion) of net profits in the first half of this year, a growth of 80.21 percent over the same period last year. The company has been included in the Fortune 500 list for the fourth straight year. It ranks the 307th on the 2007 list of Fortune 500 companies and is the sixth among all steel companies that enter the list. A foreign ship unloads iron sand at the Majishan Port on October 20, 2007. Baosteel, China's largest steel maker, has completed a project to double the capacity of the Majishan Port near the estuary of the Yangtze River, China's vital waterway.